How Should You Care For Your Dental Implants In Brampton? According to the American Academy of Implant Dentistry, 3 million Americans have had dental implants, with an additional 500,000 people each year. 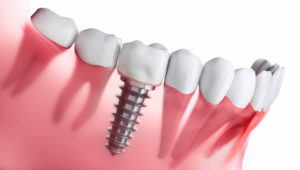 With such an impressive track record, dental implants in Brampton are clearly an excellent way to replace missing teeth! They not only look and feel more natural than any other option, but they last much longer as well. But even with the many advantages they offer, implants aren’t maintenance-free. Keep reading to find out why implants still require basic care and how you can make sure they last as long as possible! Why Do Implants Need To Be Maintained? Since implants can’t get cavities, you might think they don’t need any special attention. But although cavities aren’t a problem, gum disease is. Just like natural teeth, implants require healthy gum tissue and bone support around them to remain strong and stable. In fact, many people don’t realize that gum disease is the #1 cause of tooth loss. It doesn’t affect the teeth themselves, but the supportive structures around them. And, in advanced cases, the teeth can become loose and fall out. In the same way, gum problems can also threaten the health of implants. What’s the Best Way To Care For Your Implants? Maintain good oral hygiene – Brush at least twice a day for two minutes with a gentle toothpaste (gel formulas work well). Also, be sure to floss at least once each day and, if necessary, ask a dentist or hygienist for a demonstration because the technique is a little different than what you use around natural teeth. Use the right tools – For many patients it’s helpful to use tools like an electric toothbrush, interdental brush or oral irrigator around an implant to more thoroughly remove plaque and bacteria. If necessary, wear a night guard– Nighttime clenching and grinding put a huge amount of force on both natural teeth and implants, but wearing a night guard will help prevent any potential damage. Get regular checkups – Having your implants regularly monitored is the best way to make sure they’re staying healthy, as well as catch and treat any potential problems early on. Implants can last indefinitely with the right care, which is one of the reasons they’re such a great investment. By following these tips and tricks, you’ll be sure to get the most out of them! Dr. Summer Al Maqdassy is a general, cosmetic and restorative dentist in Brampton who has seen firsthand how implants improve her patients’ quality of life after tooth loss. Her goal is to help people enjoy those benefits for as long as possible, so she always spends time educating them on how to care for their implants. If you’d like more information or have any questions, she can be reached via her website or at (905) 792-7163. Comments Off on How Should You Care For Your Dental Implants In Brampton?